A shell fired from Syria hits the Golan as rebels, Syrian troops continue to battle near border. A shell fired from Syria hit Israel on Wednesday. 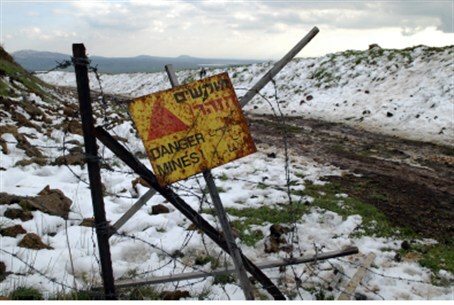 The shell was found after residents of a Golan town reported hearing the whistle of incoming fire near their community. IDF soldiers searched the area and found a shell that had not detonated. Sappers neutralized the device. The IDF believes that the 100-mm shell was fired at Israel accidentally during a battle within Syria. Residents of the Golan said they still hear explosions from Syria as rebel forces battle Syrian President Bashar al-Assad’s troops. However, they said, recently the region has mostly been quiet. The shell is not the first to hit Israel as a result of fighting in Syria. Three months ago a mortar shell hit the Golan. The IDF fired warning shots in response.